Lucky lucky! 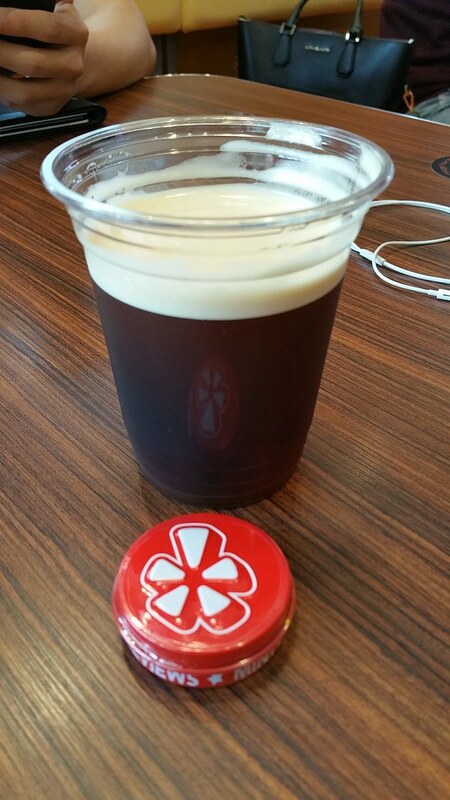 I got a chance to participate in Yelp's CaliBurger preview, a mere day before they officially open on Friday, June 3rd, 11 AM. 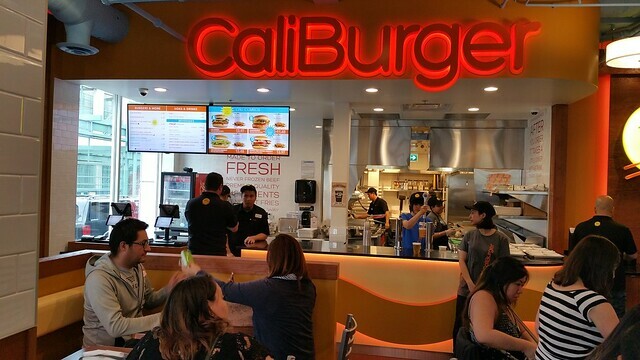 CaliBurger is an American chain just starting their world conquest, with franchises in even exotic locations like Sweden, Malaysia, and Kuwait. 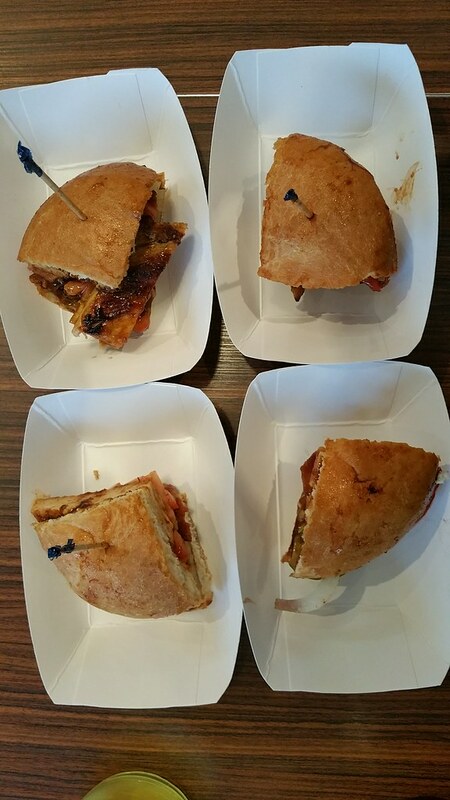 IMPORTANT grand opening event: The first 100 people in line will be entered to win 1 free meal a week for 1 year! 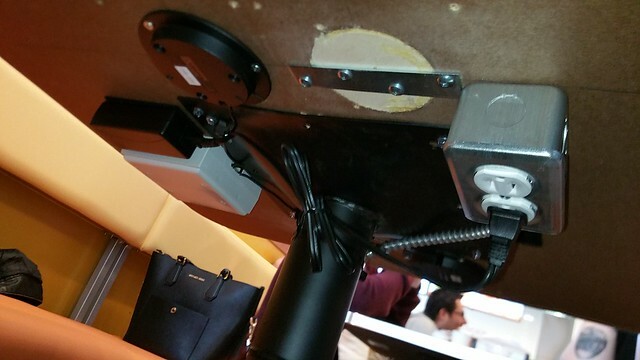 At each table there is a power outlet underneath. Use your own charger or borrow one from the restaurant. There are marked locations on the tabletop where you can wirelessly charge your phone if it has that capability. There is (of course) guest WiFi, at this time password protected. Or you can actually try getting a signal from the nearby Banana Republic! From outside the front door you might actually get 2-bar signal strength. There is a wall-sized set of TV screens (the "FunWall") with social games you can play with other people in the restaurant who also download the app. 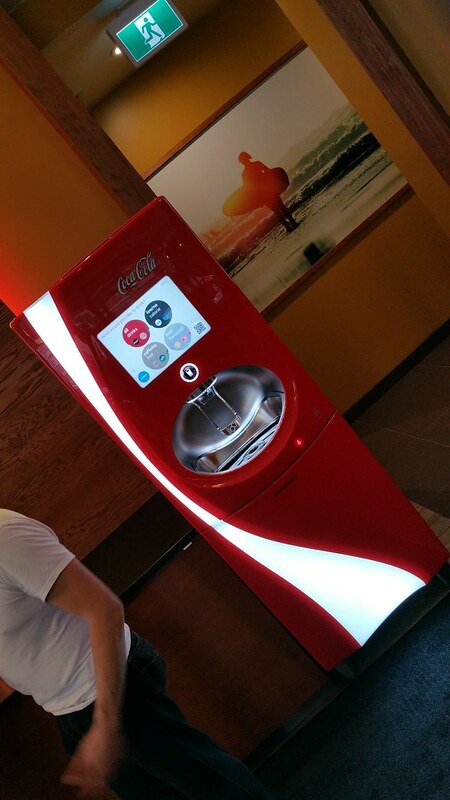 There is a CocaCola Freestyle machine where you can mix your own pop drink. $2.50 for Small cup, $2.99 for Large cup. 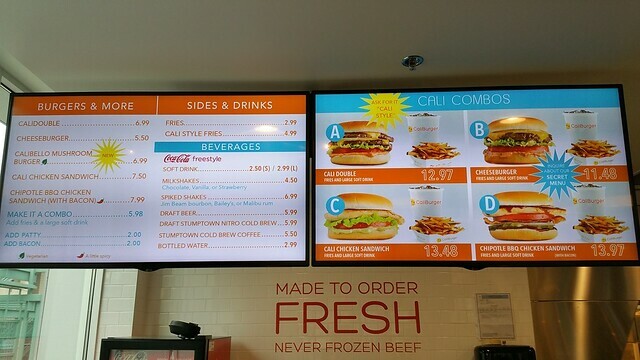 If you download the app (CocaCola Freestyle app link, or scan the QR code on the machine to get the link) you can pre-mix your drink (up to 3 ingredients) and save the "recipe", then connect to a machine (e.g., at CaliBurger) and just select your recipe. To use the app, you need an account. Even if you use your Facebook account they will want your date of birth. There is always a risk that one or more drinks is out of stock, maybe especially if it happens to be one the app recommends to you. Foodwise, I'm hesitant to actually rate them based on preview food prepared en masse for Yelpers, especially since doing mass production is actually counter to their philosophy. 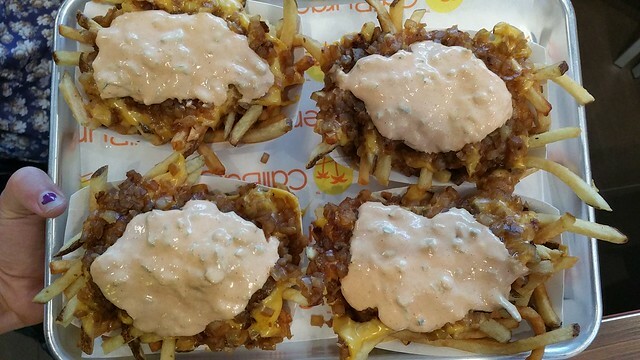 Ingredients are prepared fresh every day, including potatoes chopped up on site to make the fries. Your order is made to order -- you are getting nothing that is pre-made and just waiting under a heat lamp to be bought. To shorten the wait time, you can use their app to order. This way, when you are closer to the restaurant (determined by GPS), they start preparing your food, with the goal that there is a slight wait for pickup rather than have your food sitting and losing freshness waiting for you to pick it up. NOTE: All pictures are from preview portions, which may or may not be exactly like a "real order". 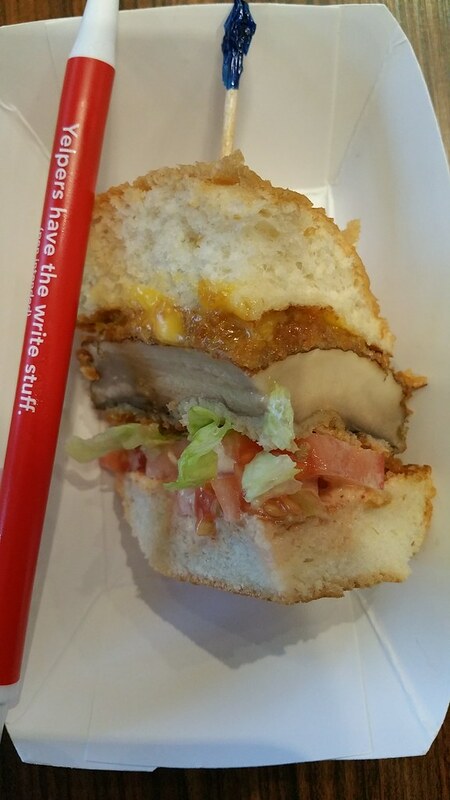 Supposedly cut on site and double-fried to order. 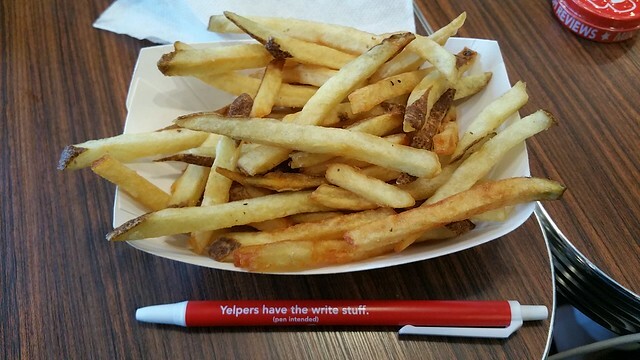 Pretty sad as double-fried fries go. Limp and not crunchy on the outside. 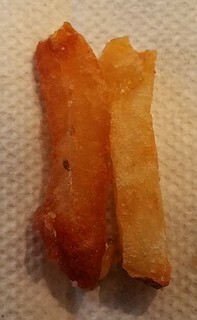 Also, not consistently fried (see picture on right, which shows an overfried greasy fry alongside a more acceptable one). Which is perhaps to be expected since they are probably not following a McDonalds-robotic-clockwork-efficiency cooking model and with ingredients prepped off-site to be cooked on-site. Until they improve their fries, you are better off spending your money on a second burger or a heavy drink like a milkshake instead. 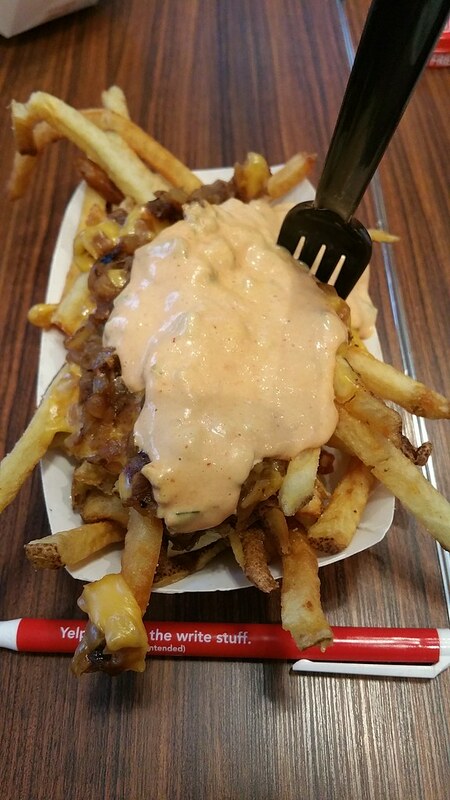 Poutine-like assembly and clingy ingredients on top means it is all too easy to eat up all the toppings, leaving you maybe a third or more of the fries with no toppings left. Can't say I'm a fan of the American cheese plus signature sauce. 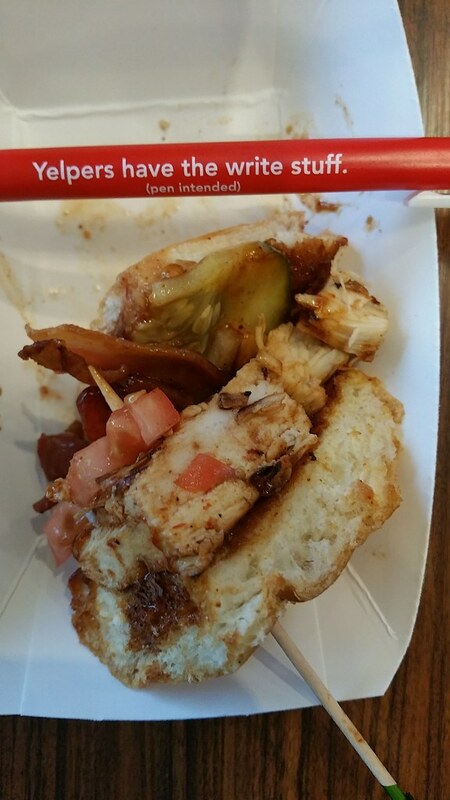 Grilled sweet onions are a nice flavour touch, but overall it felt heavy and rapidly dull. You better like the sauce or have something sharp/tangy to balance it out with, like maybe a cold pop. Draft - pulled like a beer! No sugar or cream/milk was available -- So it's gonna be bitter. Like a beer, I guess. Supposedly with double the amount of caffeine than regular coffee. Milkshake ($4.50) or Spiked Shake ($6.99) CaliBurger's refreshing milkshakes are handspun and made with rich creamy ice cream and fresh milk. Available in Chocolate, Strawberry and Vanilla. Spiked Shakes available with Jim Bean Bourbon, Bailey's, or Malibu Rum. Had a shooter-sized sample of the Vanilla Milkshake and it seemed decent enough with reasonable thickness. I'm not a drinker so I passed on trying the Spiked shake, but I was told the Jim Bean Bouirbon was spiked enough to be strong and bitter. 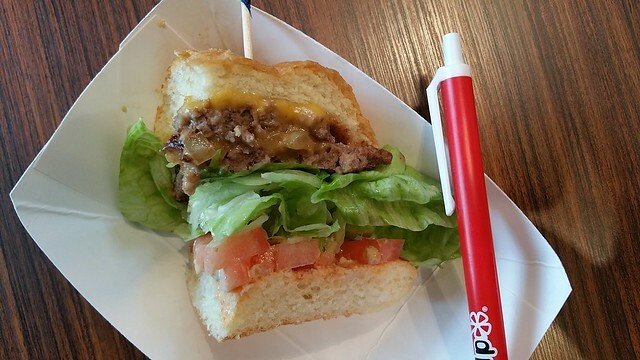 They use 80% lean meat / 20% fat (i.e., 80/20) beef for their patties. 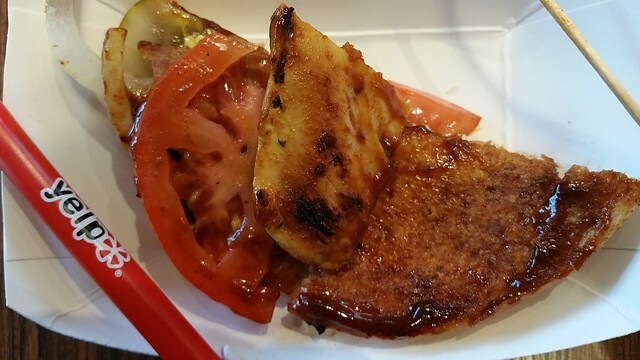 When I isolated the patty, it was tender, juicy, and a bit fatty tasting. As far as cooking goes, it was a really nicely done patty. Other than the really nice patty, it's a pretty plain burger -- but at just $5.50 (no sides), it's a really decent deal. This was really quite decent. Some spicy bite from the chipotle BBQ sauce, but not too much. It seemed to flatten all other flavours, though. Chicken breast (?) meat was juicy and tender! Nice. Plus the "patty" can be quite thick, but this seemed sort of chancy depending on the cut. Burger might be a bit smallish for $8 but it's hard to tell since we were served 1/4 burger samplers during this preview. Looked like a Cheeseburger setup, except the "patty" is a portobello mushroom cap. Since were were given 1/4 burger samples, it was hard to gauge just how big a cap you get, but it seemed least almost the diameter of the bun. Thick mushroom cap! Maybe averaging slightly over 1 centimeter thick! (Which completely blows the Portobello Burger I got from MeeT in Gastown out of the water, especially in price). Mushroom portion definitely comes through in flavour considering the other ingredients. Plus because it's a mushroom, it's tender and very juicy. 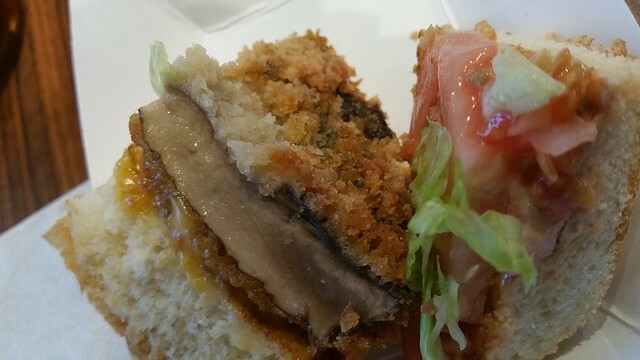 Looks like they breaded and deep fried it for a bit of crunchy bite -- which you may or may not like depending on whether you love or hate deep fried foods. But texture wise I do like this choice. 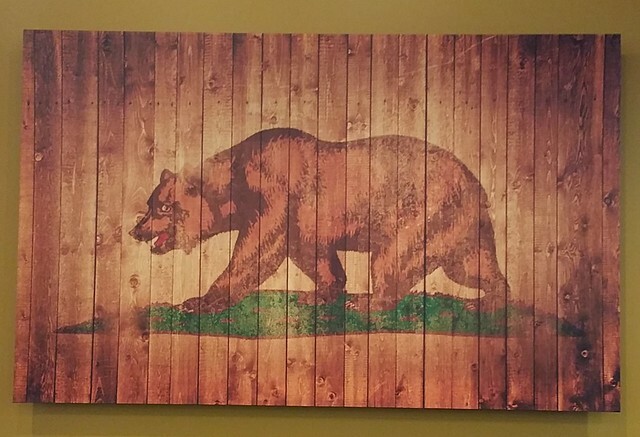 It's the California Republic bear!